So what else should you be doing ? First, consider the safety of the dog and of yourself. A frightened and possibly sick or injured dog may behave unpredictably. A sudden move may spook him, causing him to bolt into traffic or even attack you. If the dog looks or acts threatening in any way, or if for any reason you feel uneasy about the situation, stay away from him or her and notify local animal control authorities. If the dog appears approachable, remember to use caution and common sense. If you are lucky enough to get close enough to capture him or her, you still stand the risk of being bitten. Even a small dog can inflict a painful wound, and if a dog whose vaccination status is unknown bites you, you will be advised to undergo expensive and painful preventative treatment for rabies. When approaching the dog, speak calmly and reassuringly to him. Make sure he can see you at all times as you approach, and perhaps entice him to come to you by offering a morsel of food. Assume, no matter how the dog behaves or what it looks like, that this dog is owned and loved by someone who wants the dog back. This is the basis for our THINK LOST, NOT STRAY campaign. Dogs with skittish or “xenophobic” temperaments who run from strangers, especially when lost, are often mistaken as having been “abused.” In reality, many of these dogs are pampered pets who have exhibited fearful behavior since puppyhood. They are genetically predisposed to being skittish and their behavior has nothing to do with how they have been treated. Also, a dog’s appearance can be deceptive when determining how the dog was treated before you found it. A loose, lost dog will lose weight, become dehydrated, obtain injuries, become matted, and pick up ticks, fleas, and burs in their fur. So for the sake of a potential happy reunion, never assume that the dog you found was dumped, abandoned, or homeless until you have concrete evidence or until all efforts to find an owner/guardian have failed. 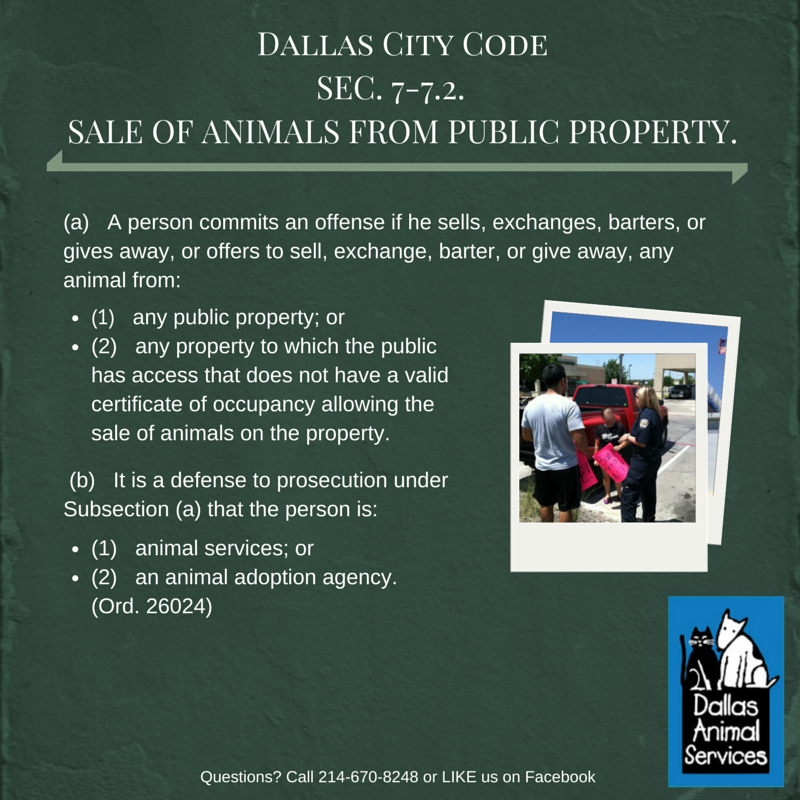 By law, you are required to turn found dogs over to local authorities (animal shelter, pound) where their owner/guardian will be able to claim them. One of the primary reasons why lost dogs are not reunited with their families is that the animal shelter is the first (and primary) location where dog owners search for their lost dogs but it is typically the last location where found dogs are taken (due to the fear that the dog will be euthanized). Very few municipal shelters have the resources available to house lost and stray animals more than three days. If you are not willing to take the dog to the shelter, most shelters will allow you to foster (house) the dog while also filing a found report by providing the description, the location where you found it, and your contact information. 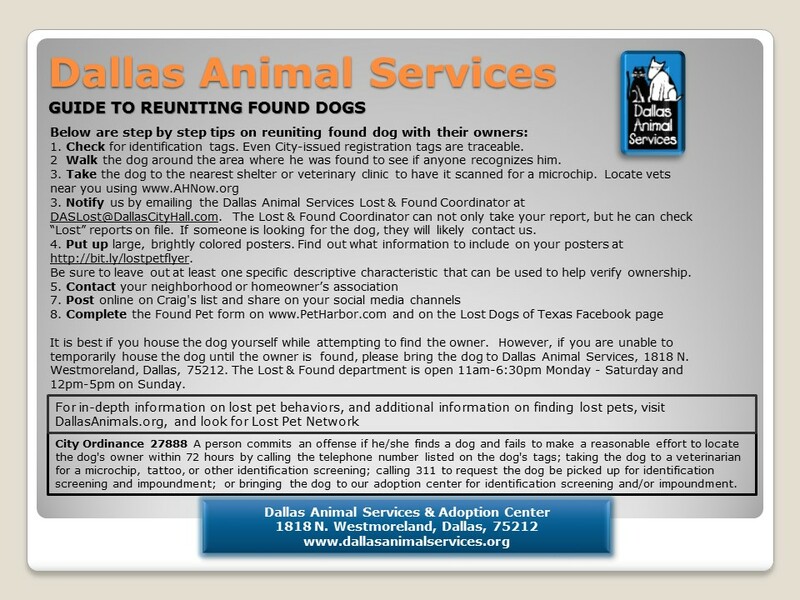 We suggest that you also create a FOUND DOG flyer to mail or take down to the shelter so they can post it on a bulletin board. Then if the owner/guardian shows up at the shelter searching for his or her dog, the shelter can put the family directly in touch with you. Check the dog for ID tags or tattoos. Tattoos are often found inside the ear or on the inner legs. Place a long leash (and secure collar) on the dog and tell him “Go Home!” Unfortunately, some people do allow their dog to roam off leash and it is possible that you found a dog that knows exactly where its home is. See if the dog will lead you to its home. If you pass by any people, ask them if they know who owns that dog. 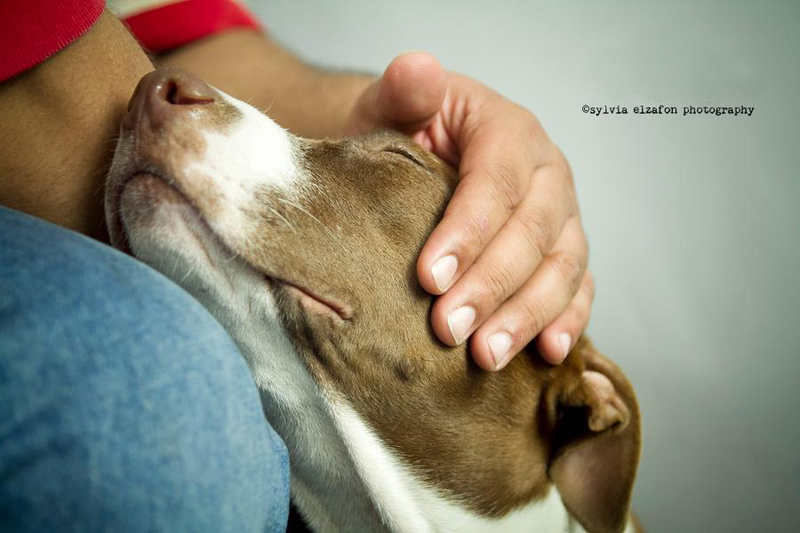 Don’t release the dog to ANYONE until you are positive that you have found his or her rightful family! Check the area for any “LOST DOG” posters, but understand that the dog might have traveled quite far and the posters could be one mile away or more. Also consider that the dog may have escaped in the last few hours and the posters haven’t gone up yet. Maybe the dog’s owner is disabled and unable to create and hang posters. Just because there is no poster, don’t automatically assume that there is no owner! Chances are there is an owner who desperately wants his or her companion home. Be sure to check back in the area and within a one-mile radius for “LOST DOG” posters for up to seven days after you found the dog. Different circumstances (health problems, being out of town, etc.) 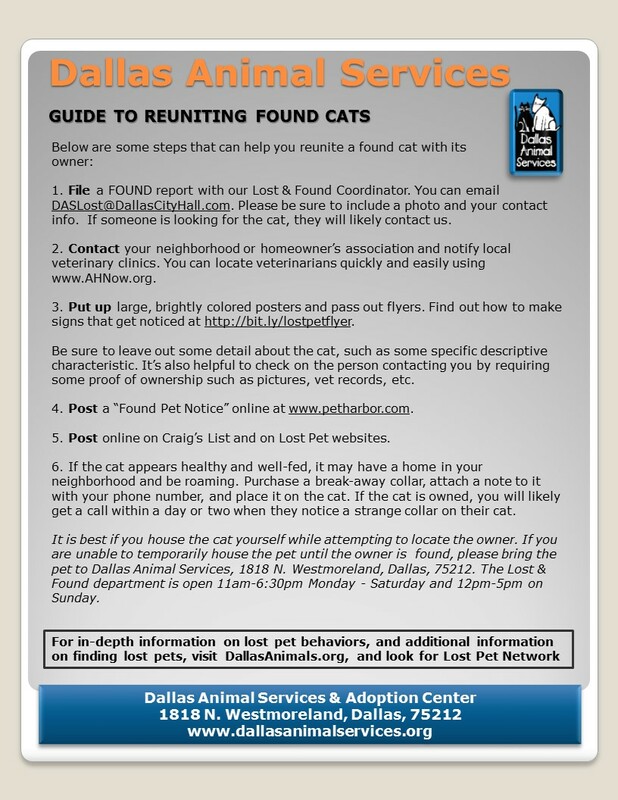 can prevent people from posting lost pet flyers immediately. Take the dog to a vet’s office and have it scanned for a microchip. Microchips are tiny computer chips containing identification information that are injected under the skin of pets to provide permanent, positive identification. Most vets and animal shelters are equipped with the readers needed to detect and interpret microchips. 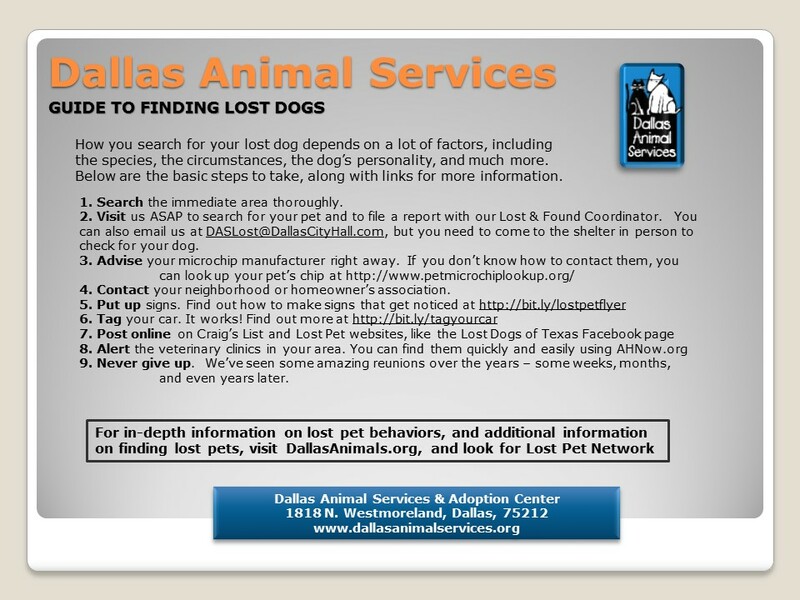 Check the “lost & found” ads in the local paper, and place a “found dog” ad yourself. 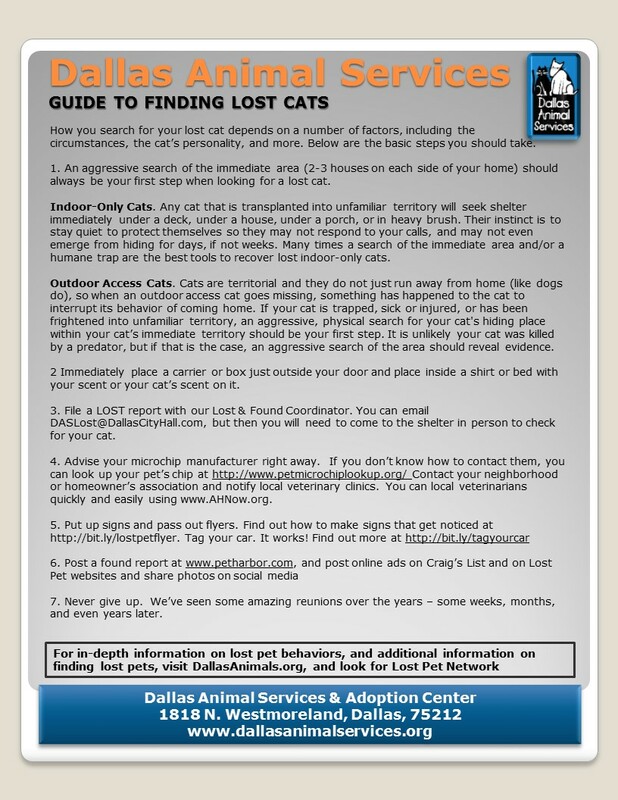 Remember to check the “lost” ads periodically, as well as local lost pet websites. Even if the description given doesn’t perfectly fit the dog you’ve found, call anyway. You’d be surprised how many pet owners, shelter workers, and individuals who find lost pets and place “found” dog ads get the breed wrong! Post a giant FOUND DOG poster near the exact spot where you found the dog and a couple more at major intersections in that area. Use florescent posters that are 28″ X 22″ in size (found at most office supply or drug stores). Using a wide black marker (do not use water soluble markers), write five or six words that convey your message, then put your phone number in smaller writing at the bottom. For example, if you find a white teacup Poodle, you could write: “FOUND TINY WHITE FLUFFY DOG” and your phone number. That’s it. Don’t be too descriptive. If someone calls to claim the dog you found make THEM tell YOU what their missing dog looks like. Ask the caller if the dog is licensed and/or microchipped. If it is, then ask him or her to bring proof of that or photographs of the dog when you meet each other with the dog. If there is no paperwork or photos, then ask him or her to meet you at your veterinarian’s office where you can have the dog scanned by your vet. If you don’t meet at your vet’s office, be sure to take a second person with you and make sure to meet in a public location. Let someone at home know exactly where you will be going. 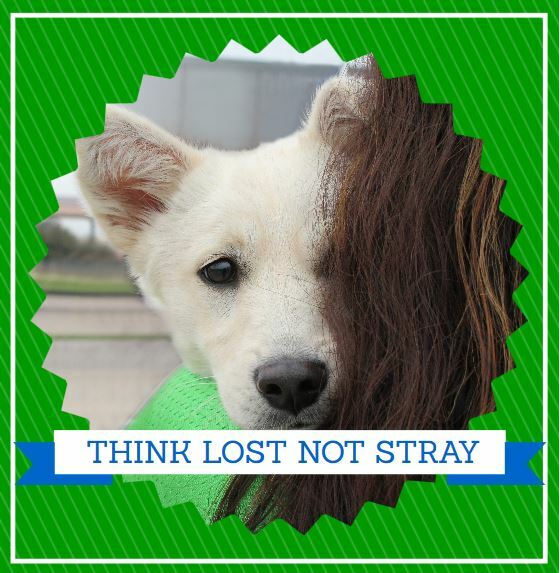 If you belong to an organized rescue group or if you routinely encounter loose and stray dogs, you can actually pre-make florescent “FOUND DOG” signs and have them on hand for the next time you find a dog. You can also affix them (with duct tape on the back) to recycled campaign signs made with a wire “A” frame. These signs are reusable and if there isn’t a telephone pole nearby, you can simply stick the signs into soft dirt next to a busy roadway and get your message out to many drivers passing by. Finally, take a photo (digital if possible) of the dog and make up some smaller (8 1/2 X 11) black & white “FOUND DOG” flyers with a partial description of the dog, the location where you found the dog, and your contact information. Leave off certain details so all callers will be forced to identify the dog. Deliver these (delegate if you need to) to rescue groups, vet offices, and pet supply stores in your area. All national pet supply store chains offer lost-and-found bulletin boards in their stores, including PETCO and PetSmart, so be sure to take flyers there. Do not let just anyone claim that the dog you found is his or hers. Do not answer any questions (from the caller) pertaining to the description of the dog. Do not ask leading questions like “Does your Poodle have a kink in its tail?” but instead ask open-ended questions like, “Describe your dog’s tail” or “Is there something unique about your dog’s tail?” Make the caller give you a full description of the lost pet. Never agree to deliver the dog to the caller unless you have first told a friend or family member where you are going and take someone along with you.